Epson WorkForce WF-100 Inkjet Portable Printer + Warranty Extension Offer! Print wherever business takes you with the WorkForce WF-100, the world's lightest and smallest mobile printer. 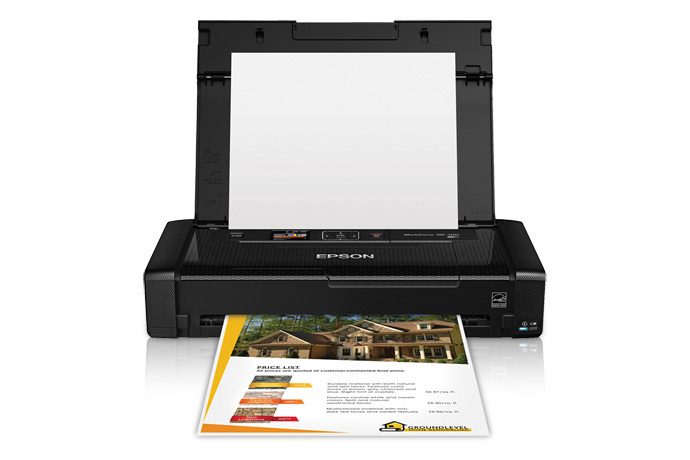 Offering built-in wireless connectivity plus Wi-Fi Direct, you can print invoices, contracts and more from your iPad, iPhone, tablet, smartphone or laptop. Designed for professionals on the go, the portable WF-100 houses a built-in battery that charges via USB or AC adapter - both are included. The automatic power-off feature saves battery life. And, the 1.4" LCD offers simple wireless setup and operation. 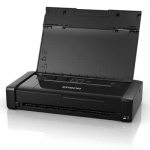 Easily print professional-quality documents and photos. Featuring fast speeds and quick-dry inks, the WF-100 is perfect for productive printing anywhere, anytime. • ISO Print Speed: AC Power Black: 6.7 ISO ppm, Colour: 3.8 ISO ppm. Battery power Black: 3.5 ISO ppm, Color: 2.0 ISO ppm. • Maximum Paper Size: 8.5" x 14"
• Borderless Sizes: 4" x 6"